If you’re a real estate agent who loves to write, than you definitely have an advantage over those who actively dislike it. Since real estate marketing success is so dependent on educating prospects, sharing information, and presenting yourself in the best possible light, you can see how being a prolific writer can give you a competitive edge in the marketplace. When you get in the habit of providing real estate prospects and clients with relevant information, helpful tips, and ‘news you can use’ on a regular basi, then you’ll develop a reputation as a knowledgeable and authoritative real estate advisor. Being regarded as a credible source of information can give you a competitive edge in the marketplace and position you as an expert. That can be a building block to winning over more clients, generating more referrals, and becoming a sought-after real estate agent. The big question is: What do you do if you love selling real estate and helping clients find the home of their dreams, BUT you hate writing? There are a lot of potential solutions, including hiring a freelance writer to create a series of quality articles for your blog, website, or monthly real estate newsletter. Another approach is to purchase an assortment of professionally written articles that you can use on an as-needed basis to provide helpful advice and tips to prospects in your farming area, subscribers to your email newsletter, and visitors to your website. 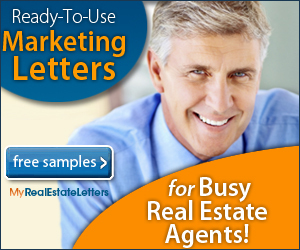 If you’re looking for worthwhile content to share with existing and prospective real estate clients, a great starting point is a marketing kit available through a website called My Marketing Letters. They offer a package of real estate marketing tools which consist of 260 articles you can use to promote your services and 320 real estate marketing letter templates for virtually any purpose. If you ever suffer from “writers’ block” or would like to provide your prospects with value-added information, then check out this set of real estate marketing tools* you can download and begin using, right now. *Disclaimer: My real estate marketing blog posts feature links to digital products, marketing services, and websites for which I am a compensated affiliate.